Hi Lynn, your looks much yummier. Wow what a sentence. Your artichokes are beautiful! I love this time of year and fresh artichokes. I will try recipe for the mayo. I've been wanting to try to make my own mayonnaise. And I agree with Farm Girl-your's looks much better than store bought-creamy and smooth. Oh, wow! Homemade mayo? I never really thought about it but yeah. I'd like to try it...I like mayo and can only imagine how much yummier it would be if I made it myself. Butter's on that list as well. I made homemade mayo for the first time last summer...and it was nothing like the stuff you buy at the store. Artichokes (or pretty much antthing else ;) ) work as an amazing vehicle to eat it! oh wow, i'm so sold! I've been meaning to try this one day, and after reading your post, I think that day will come soon! If you use melted butter instead of oil you get .... Hollandaise Sauce. I use the easy method of slowly pouring the oil into the whirring blender and it takes 45 seconds and no muscle. Good idea to add mustard. VK, funny you should mention that substituting butter makes it hollandaise, because that was my first thought at tasting this, that it tasted so much like hollandaise. Yum yum yum. So you like it made in the blender, eh? I will have to give that a try. Don't you listen to that pretentious Julia Child! You have talent - talent, I say! Anyone who's ever broken an emulsion will attest to that! I really like homemade mayonnaise. I almost had to make my own last night because I ran out of the store bought kind as I was making slaw for dinner. I ended up adding dijon and a little extra vinegar. Which totally ruined my slaw. Thank you, Kelly. I feel much better now :) That pretentious Julia Child! Ha! I've never made homemade mayo. You've inspired me! 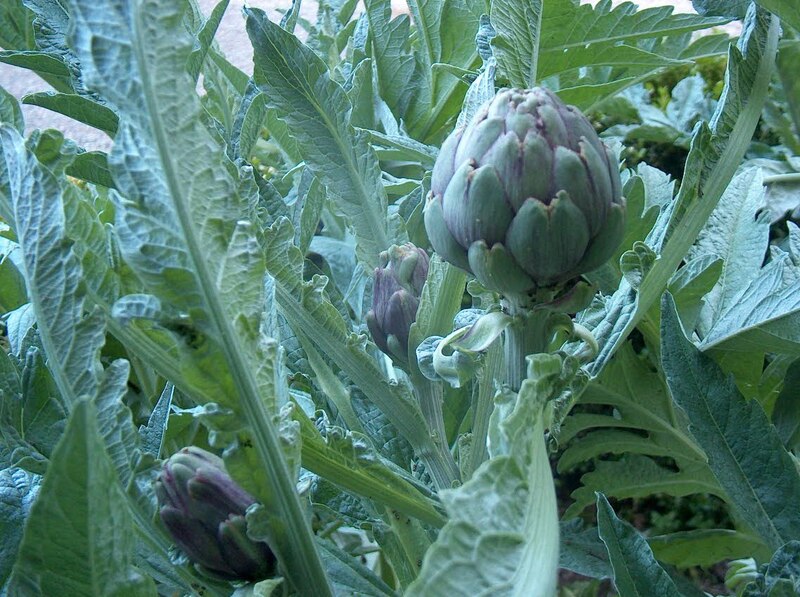 I loved seeing the artichokes in your garden. I've never seen anyone grow them before. Your mayo looks skillful to me! 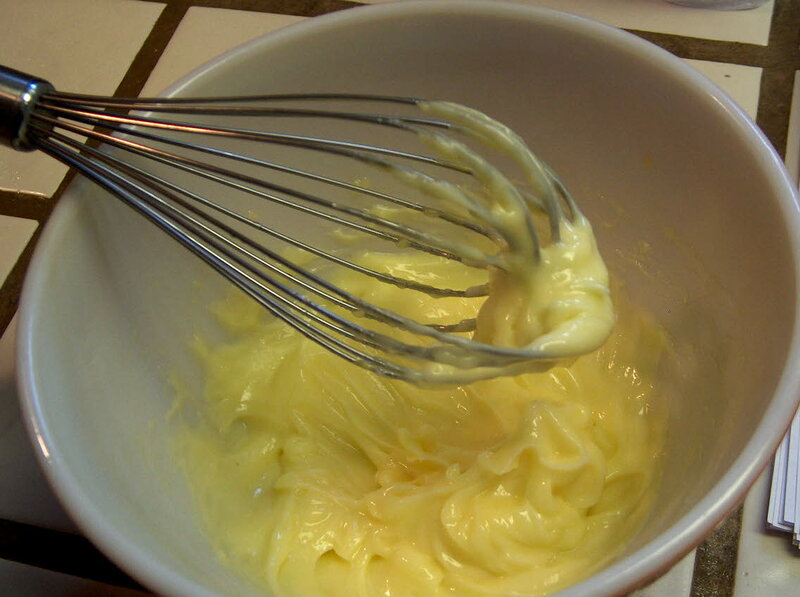 Homemade butter is good- but quite different from the store bought stuff. YES! I do know what those are; Artichokes, indeed. 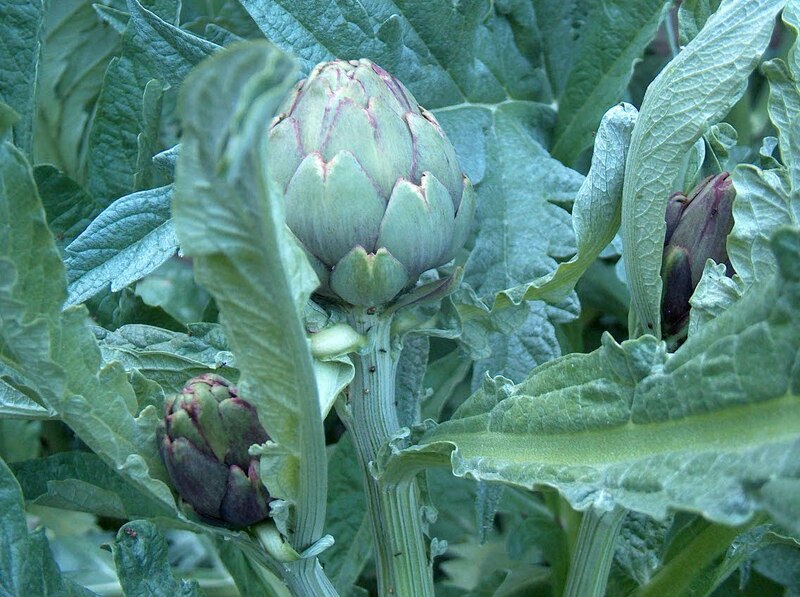 How many people do you know who have the fondest memories ever, stemming from Artichokes? I spent many afternoons stuffing artichokes with my grandmother as a child. Taking those "fuzzies" out almost the highlight of the event if not for the anticipation of the goodies at the bottom. I haven't made artichokes in years, Lynn. 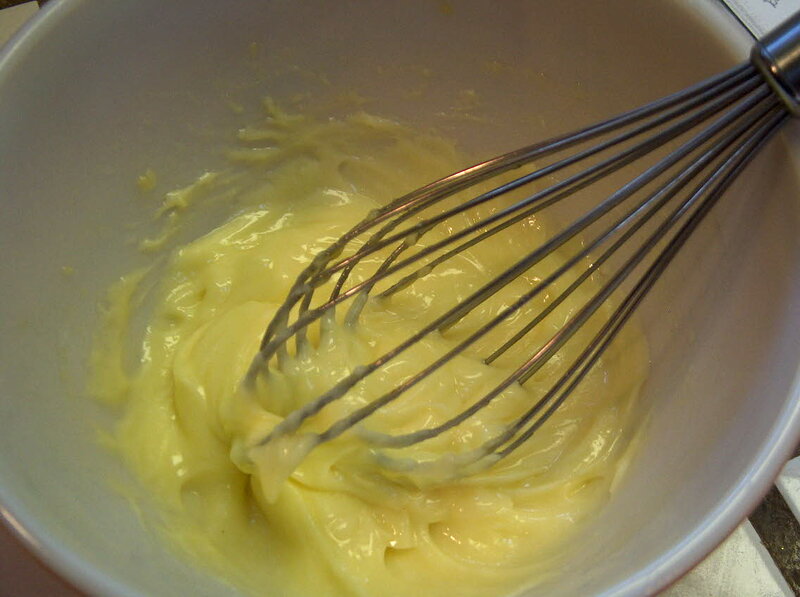 Your Homemade Mayonnaise sounds delightful. I may be inclined to add the cayenne pepper although, I'm getting a flash of perhaps something with a bit more smokey flavor. Sweet memories, Louise. And you're right, I've never heard of anyone (ever) with artichoke memories :) That makes you one-of-a-kind! I'd love to hear more about what you stuffed your artichokes with. Berji's Domain, any clue on how the homemade butter is different? I would think it might be softer and maybe a bit more lumpy . . . I have a cookbook I picked up at the library book sale (because I really do NEED more cookbooks ;)), written by Jacqueline Kennedy's former chef (in the early 60s, I believe). She has a simple-sounding recipe for homemade butter, and I'm going to try it first chance I get. Well, I've never read any Julia but I have read plenty of Lynn. And your photo proves a visual superiority. So the taste must be too. But do I have to eat it with vegetables? Can't I just spread it on bread or pasta? You know I avoid my veggies. 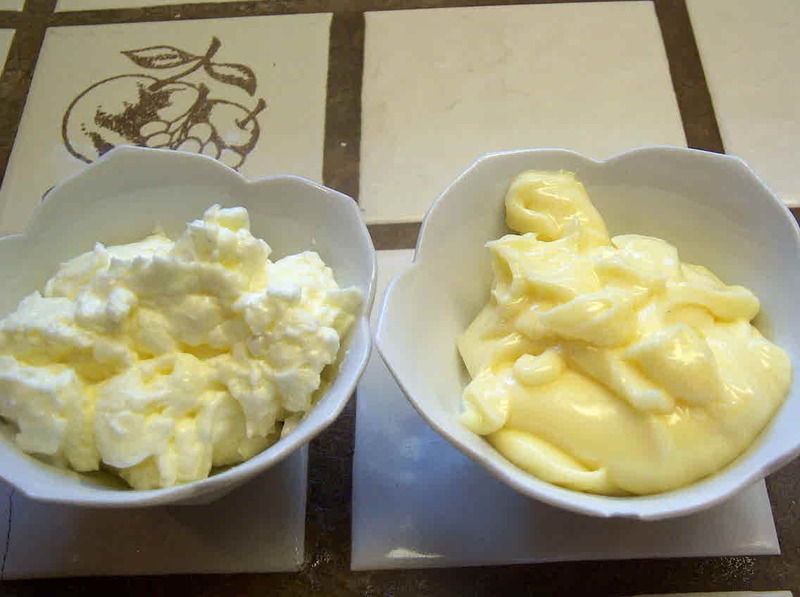 Homemade mayonnaise should have another name, because the store variety is not even in the same class. I 'm glad you tried your hand at it. Wow, that side by side comparison really does show a big difference. Yours looks fantastic! Very impressive! I think I am sold once I saw the side by side comparison. The other night for dinner I had to huge artichokes and a couple tablespoons of mayonaise. I think this would have been SO much better. Good thinking. 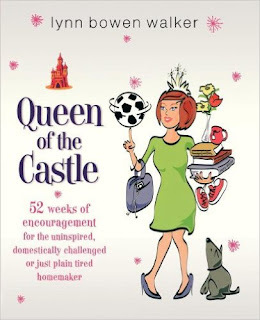 I'm going to have to try this; I've only tried once (maybe twice) to make mayonnaise, and it was not good, smiles. I would love to have the real deal on my table. This looks super. Believe me, it takes skill! 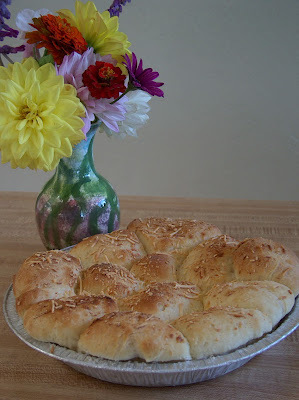 Thank you for stopping by my blog, and for taking the time to comment! I will be back to visit again soon! I can identify with your sense of accomplishment. I've only made mayo a couple of times, but it is SO much better and does make me feel proud of myself. Hmph to Julia on this one, indeed!